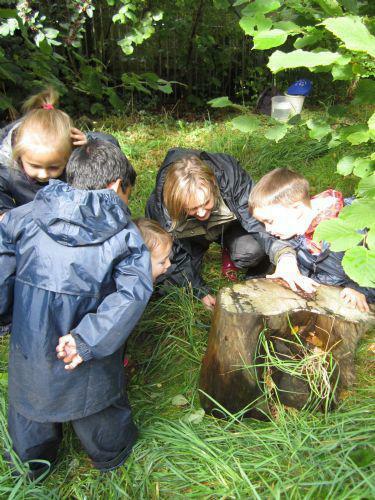 Welcome to our Forest Schools page! Forest School is a unique educational experience. It is a process that offers children and young people regular opportunities to achieve and to develop confidence and self esteem. It is a learning strategy that offers non threatening ways for children to achieve their maximum potential. This is accomplished through hands on learning experiences in a woodland environment. Its' principle purpose is to tailor make an educational curriculum to a child’s preferred learning style taking into account his / her state of well-being and previous experiences. To encourage and inspire individuals through mastery of small achievable tasks in a woodland environment, to grow in confidence and independence in order to develop well-being and a sense of self worth. To encourage children to become, resourceful, resilient, and reflective thinkers and learners who make maximum use of their environment (including the people around them) when learning. RIGHT HERE! At Tremorfa Nursery School! We have a cornered off a section of our garden and created a ‘woodland’ type environment and conservation area. We also make use of our large outdoor area. Forest school uses the outdoor environment as a “classroom”. Children work in teams, as individuals and 1:1 with an adult on small achievable tasks. Children explore their environment, collect items and ‘get creative’ with things they have found. Children use tools in order to care for the garden and to make things out of wood. Children learn about fires, fire safety and the use of fires in the environment. Polly Moakes and Simone Burman are trained Forest School leaders and will be responsible for groups. Polly is now trained as a Beach school leader and will be running sessions within the next year!